"Over the years Gammadyne has become a mission critical piece of software to our operations." "Finding Gammadyne Mailer was like a dream come true for us." "Gammadyne is absolutely the BEST bulk email solution out there." Reduce your workload. Increase your sales. By using desktop software like Gammadyne Mailer, you can save a fortune compared to email services which charge by the email. Users pay no per-email fee, and no monthly fee. All you need is a mail server to relay the emails, and these can be rented for a few dollars per month. Or you can simply use the mail server that comes with your website. Gammadyne Mailer is the only practical solution for large mailing lists. In addition, Gammadyne Mailer can track opens and clicks, providing a wealth of marketing information. Understanding your customers is critical to successful marketing. With the tracking report, you'll see how interested each recipient was in the message, where they are located, and what language they prefer. This knowledge allows you to focus your marketing efforts on the best prospects, again translating to more sales. Dealing with a flood of sign-ups, opt-outs, and bounce-backs can be a monumental chore. Gammadyne Mailer can automate the processing of these and many other types of incoming email, saving you much time and tedium. 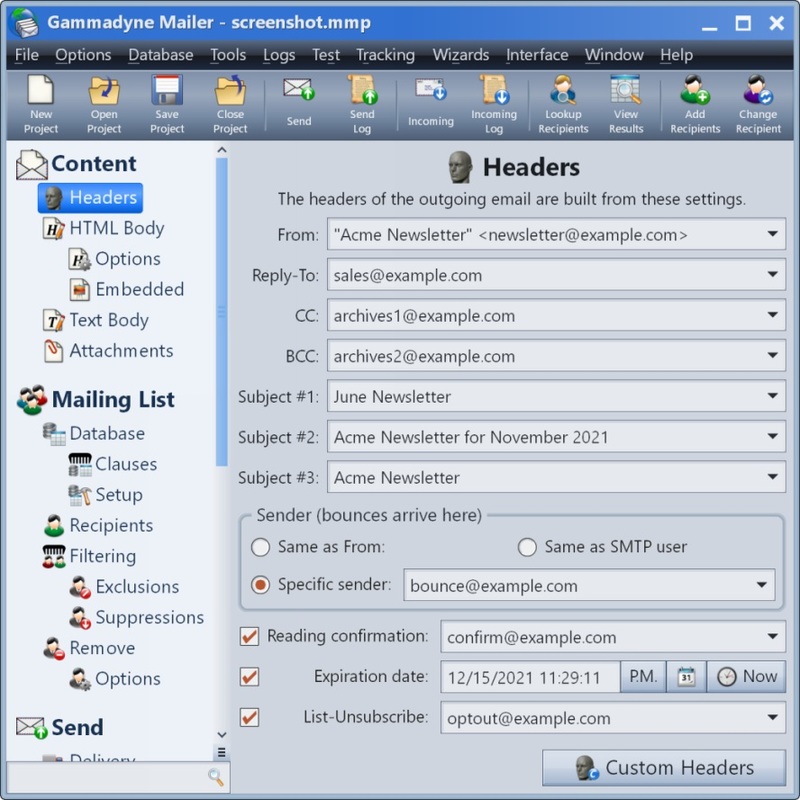 Gammadyne Mailer includes a full set of tools for manipulating the mailing list. Adding, changing, and removing addresses has never been easier. And for mailing lists located in a database, Gammadyne Mailer's database integration allows you to edit data directly (no importing/exporting necessary). Click the button below to download Gammadyne Mailer version 56.0, released March 18th, 2019. Microsoft Windows is required (XP or later). Contact us for help getting started. Video tutorials are available. The download is a self-contained executable installation program. Simply open the file to begin installation. The download is approximately 21 MB and installation will use approximately 80 MB of hard disk space. The mailing list is limited to 100 recipients. There is a limit of 50 Send Operations and 50 Incoming Operations. The Tracking feature is disabled. The "Send Preprepared Emails" and "Check Blacklisting" tools are disabled. The "Write Email To Files" feature is disabled. The "Begin With Recipient" and "Send Only To Range Of Recipients" options are disabled. Third party programs cannot use GMCOM.DLL. To unlock these limitations, please purchase a license. Click the button below to purchase a license for only $130 U.S.